Rob Francis is affiliated with The Australasian Corrosion Association (ACA) and can be contacted using the options on the right. For info on how we work with industry partners click here. The single-coat inorganic zinc silicate (IZS) coating provides one of the most durable and cost-effective coating systems available. Properly applied, it will provide many years durability in even the most severe environments, such as offshore platforms and other marine applications. It is also widely used in many other industries where color is not required, such as power stations, refineries, bridges and other engineering structures and water and wastewater treatment facilities. In fact, as long as the environment is not too acidic or alkaline, it can be used in just about any atmospheric application. There are water-borne inorganic zincs, ideal where there are volatile organic compounds (VOC) limitations, and solvent-borne coatings, which are easier to use but require humidity to cure. Both types provide similar long-term protection. Inorganic zinc has a number of unique properties compared to other protective coatings. It can be used in high temperature applications up to a dry heat temperature of 400ºC. It can be used with friction grip joints, and its toughness makes it especially effective in bolted applications that would damage other coatings. It is resistant to most solvents and was widely used for tank linings for oils and other hydrocarbons. However, new epoxy and epoxy-phenolic linings have largely taken over as they are easier to apply and clean and more resistant to acidity or alkalinity. As with other zinc coatings, it should not be used outside a pH range of about 6 to 12. Nor should IZS be used for applications where it will be continually wet, such as water tanks or underground. As a single-coat thin-film system, it can provide great cost and time savings as blasting and coating can often be done in a day. (To learn more about thin-film systems in general, see The Science of Anti-Corrosion Thin Films.) But with a single coat, you do not have the luxury of second or third coats covering any misses, so thorough visual inspection of every surface is essential. As long as weather conditions are correct, it will rapidly dry and cure, so it can be transported or put into service quicker than many conventional coating systems. As with any coating system it must be applied to surfaces with the correct standard of surface preparation. However, these requirements are not too onerous, and getting this stage of their application correct should not prove too difficult for the specifier, contractor and inspector. 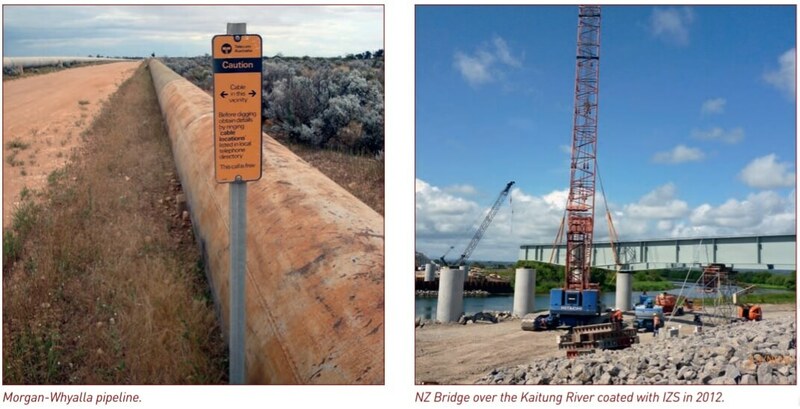 Removal of sharp edges and defects that could cause injury or prevent proper alignment of joints should always be carried out, but treatment of defects to draft AS/NZS 5131 Section 9.8.4 (ISO 8501-3) Treatment Grade P2 would normally be sufficient. As with any coating system, the next stage will be to ensure the surface is free from oil and grease. The water borne product is especially intolerant of any oil, but it is good practice to remove any oil and grease using a method described in standards such as AS 1627.1. Inorganic zinc must be applied to an abrasive blast cleaned surface, with a high standard of cleanliness. The zinc dust needs to electrically connect with the steel surface to provide cathodic protection and the coating chemically reacts with the steel. Very thorough blast cleaning (Sa 2½ to AS 1627.4) is normally required for atmospheric exposure, although some suppliers allow a slightly lower standard. This would be false economy and a clean “near white” surface should be mandatory. However, other surface preparation requirements are less critical. A surface profile typically in the range of 40 to 75 microns is often specified, but this is not crucial. (Discover how to use replica tape to measure the surface profile in the article Replica Tape: A Source of New Surface Profile Information.) 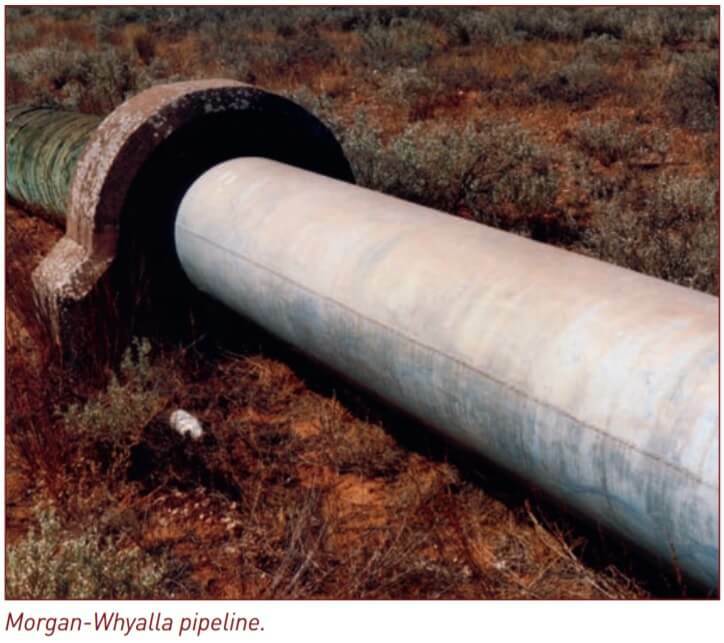 The original coating applied to the iconic Morgan-Whyalla pipeline in South Australia, still in good condition 70 years on, was applied to a pickled surface so steel roughness is clearly not essential. The blast profile should be rough as obtained from angular abrasive but the actual profile is not critical. The final requirement of surface preparation, freedom from salts, is also less critical with inorganic zincs than for other coatings. As a porous coating chemically adhered to the steel substrate, osmotic blistering is unknown. Moreover, any salt in the air after application can actually assist in the continued curing and hardening of the coating as it assists in polymerization of the silicate. A surface with heavy salt contamination will rapidly re-rust so you will lose the blast, but if the surface keeps its near white metal cleanliness, it should be acceptable for coating with inorganic zinc. In summary, other than the essential requirement for a surface free from oil and grease with a near white blast finish, surface preparation requirements for a single-coat inorganic zinc silicate coating system are not too onerous. The inspector’s main requirement would be for a thorough visual inspection to ensure all surfaces have been blast cleaned to the required standard. However, application, drying and curing of these coatings is much more problematic as discussed in the paper, ‘Inorganic Zinc Silicate Coatings: Fallacies and Facts’ published in the August 2014 issue of Corrosion & Materials.